I'm mildly obsessed with animal prints right now. 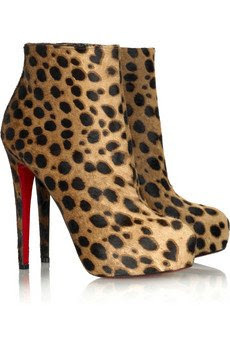 I'm in LOVE with the Christian Louboutin gray python pumps and Christian Louboutin leopard booties. Not to mention Rachel Weisz's fantastic leopard print dress! Emile Hirsch and Brianna Domont went to the 'Taking Woodstock' premiere in NY. I loved Emile in Into The Wild - he's an amazing artist but something about him in real life and Brianna comes across as swarmy. Despite my dislike, her dress is great! Olivia Palermo out and about in Manhattan looking fantastic. Penelope Cruz wore a stunning head-to-toe red suit look from Bottega Veneta to the premiere of Broken Promises tonight in London. She looks amazing! I thought I'd post this in an effort to erase the image of Sienna in that horrible sequin suit. I LOVE this dress. Everything about this look works for Sienna. So pretty! It actually pains me to write this post. Sienna has been looking fantastic lately but this sequince Gucci suit is beyond hideous! Go Fug Yourself rightly featured it earlier in the week. I feel sick just looking at it. Gwyneth Paltrow wore a minidress from Preen to the Children of the City benefit in New York last night. Preen is so cool! Blake Lively and Leighton Meester were in Central Park yesterday filming a scene for the new season of Gossip Girl. Blake's blue suede shoes are unbelievable! Seriously mind-blowing! Diane Kruger is in Berlin to promote Inglourious Basterds. She is absolute perfection! LOVE her style! Diane is casual going into a special screening of the movie on Sunday. Her hat and floral dress look great! Diane wore a yellow dress from Louis Vuitton's Cruise collection to the photo call today for the movie. Diane wore a dress from Herve Leger by Max Azria to the German premiere tonight. She can do no wrong! Amy Adams wore a dress from Roland Mouret and Brian Atwood shoes to a special screening of Julie & Julia in LA. This dress is so simple but the fit/tailoring is exquisite. I loved Lindsay Price in Lipstick Jungle. Victory Ford had the best style! Lindsay attended Comic-Con wearing a cute floral dress from Dolce & Gabbana with shoes from Rupert Sanderson. She looks fantastic. Uncle Karl has unveiled the latest Chanel accessory - a branded Chanel motorcycle. Unfortunately his boy toy doesn't come with the bike. I love these images of Georgia May Jagger in French Vogue. She's so cool! I know it's still July but I can't wait for Fall! 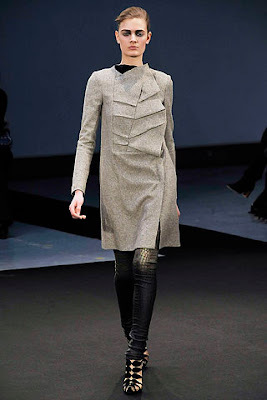 Roland Mouret's FW09 collection is full of beautifully structured dresses. The coat above is fantastic! The annual Cartier International Polo Day was held in the UK today. It was probably the most fashionable crowd this polo field has ever seen. Poppy Delevigne - LOVE her! Amanda Crossley and Kate Sumner. Amanda's dress is sublime! Alexander Spencer Churchill. Not sure who he's with but I like her jacket. Everyone knows I'm not usually a fan of Beyonce's style. 99% of the time she wears tacky, too-tight, bedazzled outfits on the red carpet. But when Beyonce gets it right, she looks fantastic! I'm a big fan of her relaxed style here. The yellow hat and yellow YSL Tribute sandals look great! The styling and proportions of this look are perfect - strong shoulders, mini dress, OTK boots and chain necklace. LOVE! The teaser trailer for Tim Burton's Alice In Wonderland has been released and it looks amazing! Visually stunning! I can't wait to see this film. I'm obsessed with the new Silk Frances Cami from J.Crew. It has a regal, stand-up collar and heavenly ruffle-front bib. It's a great piece to dress up or dress down and can be easily layered with a number of pieces. I really like the way it's styled in the photo above with a long cardigan and short skirt. Now I just need to decide what colour to get! I've just rediscovered my love for Bumble & Bumble's Surf Spray. This product is fantastic! It creates the most amazing beach waves. I have pin-straight fine hair and it works wonders. It's the first product I've ever used that actually creates California-worthy waves. Do you have any recommendations for products that work wonders on your hair? 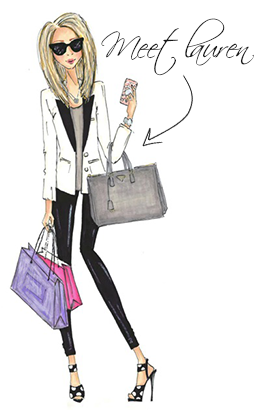 Love this image from Style and the City. I'm drooling over her blue Chanel classic flap! Uncle Karl has a new muse. Karl and his boy toy Baptiste Giabiconi were in Berlin yesterday. He looks very inspiring. Diane Kruger wore a Balmain dress with Louboutins to the London premiere of Inglourious Basterds. She is perfection! Sienna Miller attended a photocall for 'G.I. Joe: The Rise Of Cobra' today in Berlin. She's been looking fantastic lately. I love her casual laid-back style. 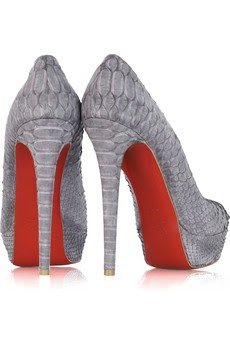 Victoria Beckham was swinging in her Christian Louboutin's while filming a commercial today in London. She leads a charmed life! The Fendi Fall/Winter 2009/2010 ad campaign featuring Jessica Stam is stunning! The campaign was shot by Uncle Karl himself. I love the dark, mysterious quality of the images. 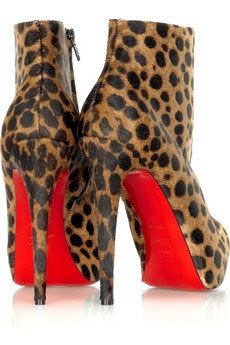 I'm lusting after the shoes in the first photos and the amazing red/leopard print peek-a-boo bag!